Posted on August 11, 2011 by Monsieur K.
Editor’s Introduction: A good part of me remains very private, especially the writer caught in the act of composition. We write (I do) best in the dark. “Light” whatever its nature comes only in publication. There’s a quality of “for my eyes only” to this new website, North of Kafka. But there is also a part of me that needs to share—perhaps with you alone, perhaps with a number of others. I must be the judge of that depending on? Impossible to explain. You may receive this North of Kafka and no other. Or some of them. Or all of them. Or none of them. (“What’s he trying to say?”) That’s the point of it. Perhaps. There will be no subscription to this site. It will find the reader through my mailing list as I run down the names and send the latest North of Kafka to those I instinctively feel at the moment might take it to heart and mind. “North of Kafka #1,” which finally appeared in WINTER BOOK, Ellis Press, 2002, was a column of sorts, a personal essay, a literary concept I intended to send to a few friends the old fashioned way—stamp, envelope, a letter in a mailbox. This was before websites and what came to be called “blogging,” which still sounds like an indecent act I am reluctant to commit. I’m a writer not a blogger. 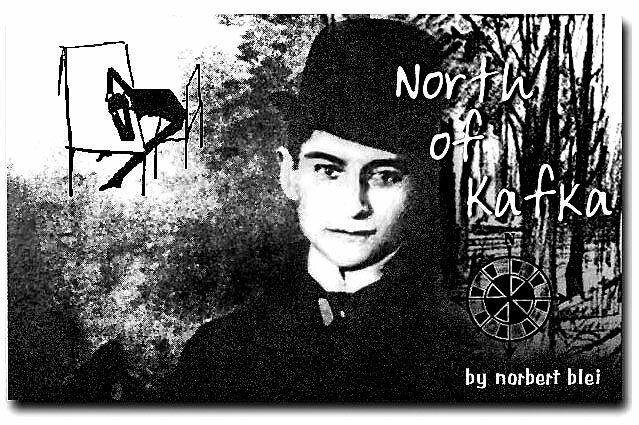 “North of Kafka #2 has been printed online in a number of places, including www.norbertblei.com. #3, in notes for years, I can hardly relate to now and at this point consider abandoned. It was a project I planned to continue, but like so many plans one grows weary of them in time, loses interest, and the writer walks away seeking someone else inside himself. It is not my desire or intention to reprint either #1 or #2 here…as helpful as they may be for some perspective. My intention is to move on…forward…backward…wherever I find myself: the unreliable narrator. But this is not about me, no matter the possible parallels, as readers who bear with these occasional narrations shall come to see. Many hats. Many faces. Many people. Who am I today? This is a story wanting to be told in any way, by anybody in the writer’s psyche seeking a voice at that moment. Thus the unreliability of the narrator. Thus, a work progressing, true and false. Thus, fiction. So consider this a transition, a new page, a fresh beginning. It’s also an image, a metaphor I can’t let go. Which means the work remains unfinished. There is more and more to say in the little time left. The top of the pinewood coffin closes… ”Wait, did I tell you about?” The storyteller never dies. “North of Kafka” came to me near the end of winter in a cabin overlooking Lake Superior in Bayfield, Wisconsin, around the millennium, where I found myself standing alone outdoors on a cold night looking into the dark, sipping a cup of coffee with a little brandy, confronted with the age-old theme of loss. And more. The loss of my father. The loss of my long marriage. The loss of the house where I grew up, The loss of Chicago, the streets, the people, the stories, the work and passion of a writer. The growing loss of almost every means of survival as a freelancer. All this continued to mount. There was never, would never be enough money in this ‘business’ of writing (though I prefer ‘calling’.) not to mention reason to keep doing ‘it’, becoming one. Which was the subtitle of my fiction, THE SECOND NOVEL, Becoming a Writer. To admit you were a writer was to admit you were a failure. Newspapers were dying. Paper had given way to screen. My world had become old: yellow pencils sharpened with a knife, broken fountain pens, bottle of black ink, paper that felt good in your hands (Chieftain Bond, 50% cotton fiber sub 20, grain long, cockle)…gray manual typewriters (Olympia, Royal, Smith-Corona) that sang in the key(s) of tap, tap, tapping fingers. The losses continued to add up: The loss of the old neighborhood, boyhood friends, relatives. The local cemetery was full of family; my heart was empty of what once was. I had tossed a shopping bag of clothes in the trunk of my car earlier in the day, a briefcase of files and notebooks, pencils and pens…novels, books of stories and poems…unread copies of Harper’s, old New Yorkers, The New York Times. Fresh clothes, books, writing materials…fragments of small dreams still left for a writer beyond the middle of his life… Destination? Why North? Back to (forward) to more winter? Why not South—Sweet Home Chicago? East? West? The map inside me read Kafka territory. This entry was tagged Franz Kafka, Norbert Blei, North of Kafka, Poetry. Bookmark the permalink. Well, not being the cheeriest thing you’ve written, I’m happy to receive all your words. And my life is comprised only of second acts! So join in the possibilities of new endings. You’re really onto something special here…and anyone you pick and choose to get this should indeed have their own splendidly heartfelt/mindfelt definition of how and why it is special to them. I do. Unlike the snakes that slip out of their old skins with slow silk ease, we wonder, over and over, what we have gained or lost til we rattle ourselves. An unusual assembly of quotes from Kafka transposed to and around Chicago, and thus from Europe to the USA. Thus I would like to start with the last quote with Kafka claiming a point of no return. In his life he constantly turned around, especially with regards to women who he was about to marry and then stopped short. That became his fate. A beautiful insight into his fear gives his letter to Felice when she spends her time in Frankfurt. Kafka writes to her that he could not exist amongst those businessmen; he only exists in-between the lines he writes. Thus existence through writing is something akin with many other writers, you included, and thus there is this hamstrung syndrome, but what if in writing there comes a point of no return? Pavese knew about it. We have talked about that before. I want to close with a reference to the literary criticism of Nathalie Sarraute. She compares Dostoevsky and Kafka insofar as she claims both would have written similarly if Kafka had lived in the age of Dostoevsky, that is during a time when good and evil where not torn apart as much as at the beginning of the 20th century. She adds that Kafka felt the time of technology and science had come with scientists willing to go much further in their experiments than what people were willing to follow or able to understand. Sarraute says Kafka followed in his imagination those scientists to seek a point where they would turn around and become once again understandable to people. Today instead of scientists bankers go with their figures further than what people can understand, and there is no turning around despite heading for a financial crisis. In that sense the writer must find either a new imagination to follow those who dare to tread where no one else does or else succumb to the myth of a world having become less understandable in human terms than ever before. In that sense Kafka has become a symbol for those who turn around and give up writing evean though they should continue. With greetings from a cafe on the Greek island of Spetses, take care and wonderful to see you at work. You still have some miles to go before you hit the rock. Press on. In the meantime, the hell with F. Scott…there ARE indeed second acts! south of, keep it up. My shelf of your books is not far from my several books by Kafka. I like your Kafka references, as would anyone who has read your work and his. I too see the struggle of serious writers for learning/insight/purpose in what may be an absurd condition, but also one in which the writer may find solace in the act of writing. I hope to stay on your list. Manual typewriters, pens, pencils, bond paper–the tactile tools of writing–are a means, a comfortable and comforting means, but only a means, as the cuneiform chisel to clay was a means, as the quill to papyrus was a means. The writer and the writing remain. With today’s means, Mister Writer not Blogger, you touch a large and appreciative audience of readers–and they can and do respond. There’s some good in that, no?